This is a photo of members of the 1947 Journey of Reconciliation. 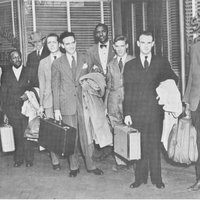 Left to right: Worth Randle, Wallace Nelson, Ernest Bromley, James Peck, Igal Roodenko, Bayard Rustin, Joseph Felmet, George Houser and Andrew Johnson. 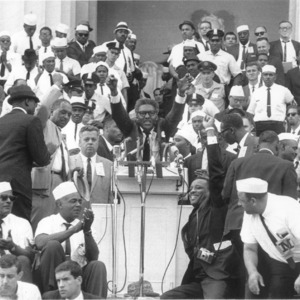 This is a photo of Bayard Rustin at the March on Washington (MOW) in 1963. 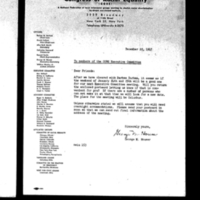 Although A. Phillip Randolph was the initiator and head of the MOW, it was Rustin as the deputy director who was recognized as the main organizer for the march. This is a film clip of Bayard Rustin debating Malcolm X at the Community Church in Manhattan on January 23, 1962. It is not the entire debate but clips of the debate. This is a October 30, 1961 photo of Bayard Rustin (seated left) and Malcolm X (standing) at their Howard University. debate. Seated to the right is Michael Winston, the debate moderator. 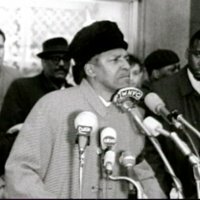 This is the audio of Bayard Rustin debating Malcolm X in November of 1960 on WBAI radio in New York City. Give it a minute to come up, its a large file. You may have to press the space bar on your computer to pay the file.